Everyone and anyone who has ever been associated with the “Star Wars” franchise is being cornered to ask their opinion about J.J. Abrams’ upcoming Star Wars: Episode VII, mainly to find out their involvement. 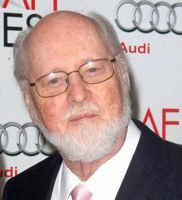 Eventually that would get around to composer John Williams, whose theme for the original Star Wars may be one of the most recognizable pieces of film music of the 20th Century. That’s all good except that J.J. Abrams has worked almost exclusively with Michael Giacchino even on the Spielberg-influenced Super 8, so while it’s nice that Williams wants to continue doing more “Star Wars” music, he seemingly isn’t even aware that George Lucas is no longer involved in these. With that in mind, it’s all going to come down to whether Lucasfilm mandates that Abrams uses Williams rather than his own guy.